When it comes to journaling, what’s old is new again, and it isn’t going away anytime soon. Living in the digital age has simplified many daily activities – everything from shopping to banking to even communicating with long distance loved ones. However, research has found that 83% of teenage girls keep some version of a pen and paper diary or journal, which is up from 69% in the 90s. What is it about pen and paper that is preferable to Tumblr or livejournal? According to scientists, keeping a hard copy journal is a natural way to reduce stress and unwind. Additionally, further research found that 95% of teenage girls worry about a lack of privacy in posting their feelings online, which is a relatable concern. Surely, you don’t have to be a teenage girl to share those feelings or to reap the benefits of journaling. Read on below to help get you started on your way. There are many perks to keeping a journal. Perhaps first and foremost is stress management. A form of emotional release, writing in a journal can help to organize thoughts and develop problem-solving skills. Putting pen to paper to capture ideas and feelings is a healthy way to cope with life’s challenges and hardships, while simultaneously creating a time capsule to revisit at a later time. 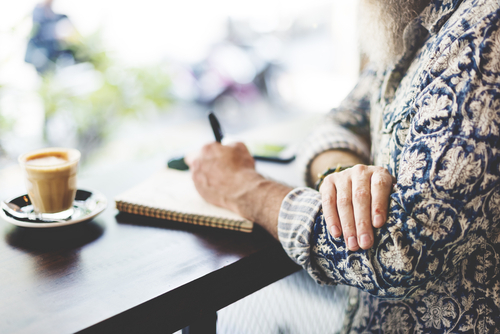 Writing in a journal can also facilitate self-reflection, which can lead to important discoveries about addressing loneliness and self-esteem. Similarly, keeping a traditional journal can help to unplug in life. While many seek the comforts of the internet in times of stress or anxiety, physically writing feelings down on paper declutters your mind and forces out distractions. By concentrating solely on the task of journaling, you become more in tune with yourself and the thoughts going through your head. When writing out feelings or ideas, it is natural to organize them in a linear style, which can lead to clearer organization and understanding of one’s thought processes. In doing this, writing skills are developed, which can prove useful in many other facets of life. Whether it is for work emails, school reports, or letters to friends, writing in a journal can help improve writing skills. The more you write, the better you’ll become at it. If you struggle with finding your voice, have no fear. There are many different ways to capture your thoughts, and it is simply a matter of finding what works best for you. If you aren’t able to write in a free flow style, focus on a specific topic that compels you to emote. Then, record your feelings about the topic on paper. The topic can be anything you want it to be – exercise, school, career, dreams, etc. It can be as defined or abstract as you’d like. For example, some women choose to keep a pregnancy journal to track their moods, weight gain, and even ultrasound photos of their baby’s progress. Other examples include travel journals to record vacation memories or photography journals comprised of one’s photos over the years (first day of kindergarten, college graduation, wedding day, etc.). Bullet journals are also on the rise as a convenient way to combine to-do lists, calendars, and goal-setting. Ultimately, there is no right or wrong way to journal, as long as you can get started with a way that works for you. One of the goals of keeping a journal should be longevity. In order to track your progress (whether it is related to a specific plan of action or just to monitor how your writing is developing), you need to stick with it. Set aside a specific time of day for journaling and keep it as a regular appointment with yourself. Treat it as private and do it in a quiet, relaxing place where you can unwind your thoughts. Also make sure to date each entry in your journal so that you may revisit it at a later time. Tell yourself to write freely and honestly to prevent any mental blocks along the way. Remember, this is your sacred time for yourself, so regard your practice with sensitivity and respect. Journaling is an insightful way to uncover truths about yourself, set goals, and record progress. What tips do you have for those looking to get started? Share your best practices in the comments below! This entry was posted in Informational, News and tagged Journaling, Reduce Stress. Bookmark the permalink.